Between Us Only! Original Book Redo! | My Majid Books! Home » Between Us Only! » Between Us Only! Original Book Redo! Between Us Only! Original Book! Book 49 – 55 & 14-55 – Between Us Only! This is a reproduction of my first book published in Oman in 2003. The book had no images and was an issue raised by many Readers being a big book! Despite several books later, many Readers still think that this was one of my best books! 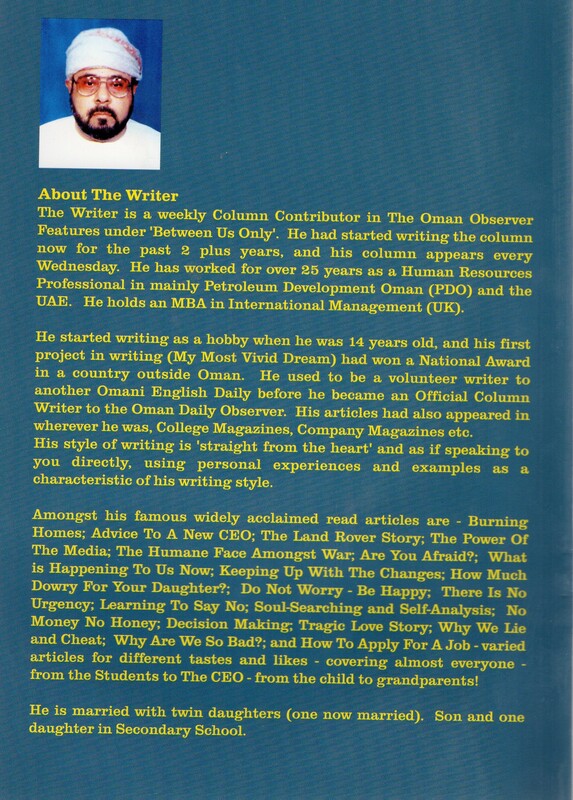 When I wanted to publish my Column Writings in The Oman Daily Observer Between Us Only! I went around all VIPs Establishments NGOs and Others for my need to publish a book containing all my articles! There were No Takers – and everyone ignored me or looked the other way! Nobody wanted a book that Spoke The Truth and Refused to push the dirt under the carpet – or as was being said to me – Why do you want to wash our Dirty Linen in public for all to see – and to advantage of Expatriates? After a lot of talk and persuasion The MB Group agreed to support the publication of the book )The Blue Cover One!). Unfortunately there was no time to add images – which was The Biggest criticisms of the book! I always dreamed of republishing the book! By God Allah SWT Mercy Grace and Blessings – Al Hamdu Lillah – I republished the book with images – and Three Versions of it too! This is my 48th book – and after 6 books on Arab Management, 3 on Road Safety, 3 prior of this on My Autobiography (The Story of My Life!) – 12 on my Columns Writings ‘Between Us Only!’ and ‘At My Workplace!’ and the rest on assorted topics! The book is a bird’s eye view all about me from my all varied articles to date! If one wants to write my Obituary then there is no place to start than from this book – but not forgetting reading the other books as well! I apologise in advance – as I do feel I may have missed out in some articles! But writing my Bibliography, this book will go 90% in doing the work! The articles produced here are in main part linked to me as Majid aka as Magic – Magic Man as the pseudonym I used in ‘The Forums’! There are several bits and pieces spread out in my other 28 books where they could also come here – but then the book will be very big in size and in contents! I hope you will like reading about me! 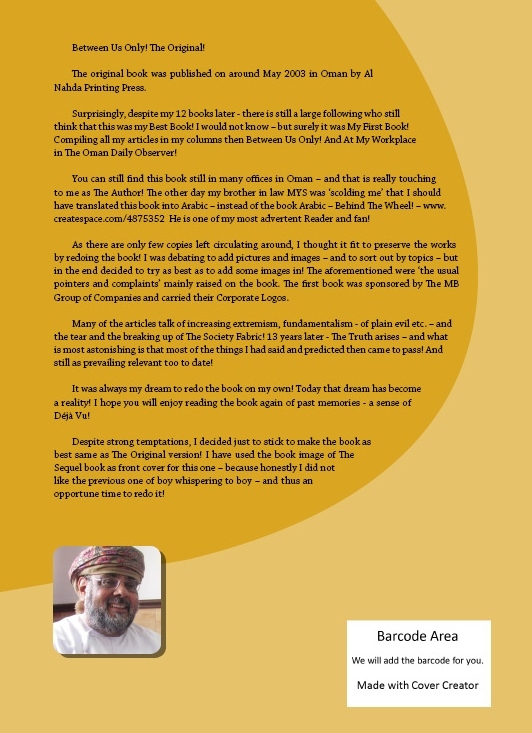 You can still find this book still in many offices in Oman – and that is really touching to me as The Author! The other day my brother in law MYS was ‘scolding me’ that I should have translated this book into Arabic – instead of the book Arabic – Behind The Wheel! 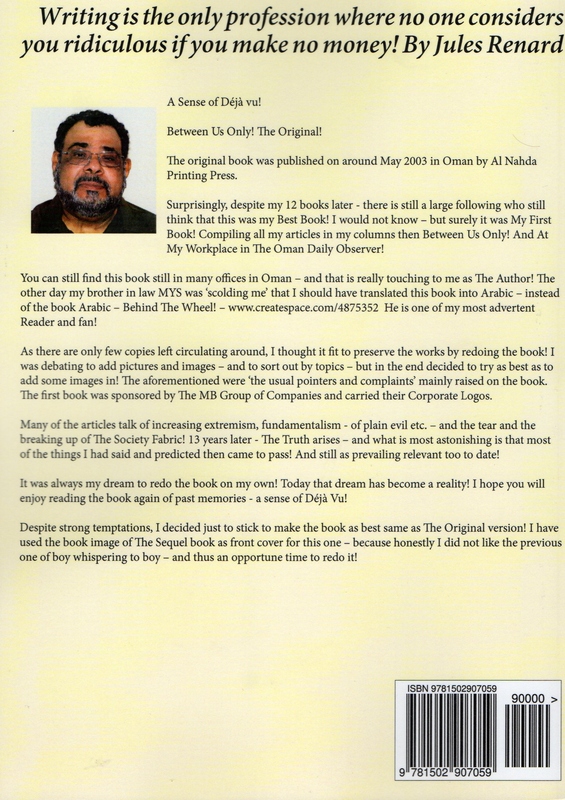 – http://www.createspace.com/4875352. He is one of my most advertent Reader and fan! As there are only few copies left circulating around. I thought it fit to preserve the works by redoing the book! I was debating to add pictures and images – and to sort out by topics – but in the end decided to try as best as to add some images in! The aforementioned were ‘the usual pointers and complaints’ mainly raised on the book. The first book was sponsored by The MB Group of Companies and carried their Corporate Logos. Many of the articles talk of increasing extremism, fundamentalism – of plain evil etc. – and the tear and the breaking up of The Society Fabric! 13 years later – The Truth arises – and what is most astonishing is that most of the things I had said and predicted then came to pass! And still as prevailing relevant too to date! It was always my dream to redo the book on my own! Today that dream has become a reality! I hope you will enjoy reading the book again of past memories – a sense of Déjà Vu! Despite strong temptations, I decided just to stick to make the book as best same as The Original version! I have used the book image of The Sequel book as front cover for this one – because honestly I did not like the previous one of boy whispering to boy – and thus an opportune time to redo it! The Author is an ex-retired now Management and Human Resources Consultant, Advisor, Expert and Professional with over 40 years experiences in companies in Oman and GCC. Lives in Muscat in Oman – married with grandchildren. Writing has been his passion and hobby from the age of 14 years old and his first essay had won a National Competition at this age. He has been writing wherever he was – from Schools, Colleges, Universities and Company Magazines and Newsletters! He is also a noted and famed Columnist where many of his books originate!